So today’s the day. Today the Irish government hands €1.25bn of public money to the unsecured, unguaranteed bondholders of a defunct financial institution. The stated reasons for this transfer of wealth make absolutely no sense. The real reasons are purely ideological. What’s happening today is the logical conclusion of allowing capitalism to remain unregulated. Don’t get me wrong, I’m well aware that this grand larceny flies even in the face of free market philosophy. But capitalism is not synonymous with free market philosophy. Of course, I’m no fan of unrestricted free markets either, but at least under that system – if it was being correctly applied – it would be those who invested in Anglo-Irish Bank who would lose money; not the citizens of Ireland who could have expected no share of the profits had the investments panned out. What’s happened is that capitalism has co-opted the language and appearance of the free market to permit ever greater accumulations of wealth in ever fewer unscrupulous hands. Our system is more akin to the robber barons and gangster capitalists of the late 19th century than it is to some ideal of free market economics where wealth flows efficiently to those who “generate” it. 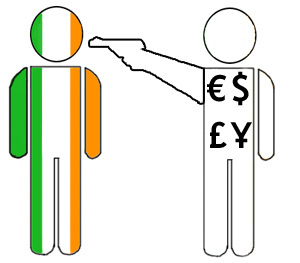 The Anglo-Irish Bank bondholders did not generate the wealth they are receiving today. And as David McWilliams points out; by allowing this insanity to continue – worse, by encouraging it – the Irish government is losing credibility in the markets, not gaining it. The finance capitalists who are now running our nation from afar have managed to hoodwink and pressure those elected to represent our interests into acting as though our interests were in fact synonymous with those doing the hoodwinking. And they’re not. In reality, they are diagrammatically opposed. And as we hand over our money, I feel certain that the investors can’t quite believe their luck. “Is it possible”, they wonder, “that the Irish people are really as thick as the old jokes implied?” Certainly that sad excuse for a leader we’ve got, Enda Kenny, seems to think so. Today, as he signed the metaphorical cheque, he insisted that Ireland must honour its debts. “We have paid our way and will pay our way”, he told the Dáil. Here’s the thing, Enda, I don’t know anyone who doesn’t agree that Ireland should honour its debts. The problem we have – and it’s one that you don’t seem to have the wit about you to appreciate – is with honouring the debts of others. Today’s transfer of public wealth into private hands is not paying our way. It’s paying someone else’s way. Someone who not only doesn’t have Ireland’s interests at heart, but whose actions are impoverishing the citizens of this nation; whose greed is laying waste to our society. And although you may equate those reckless fools with “Ireland”, the rest of us really don’t. Your place in history, Enda, will be an ignominious one. Our last government sold us out, and you eagerly embraced their madness. There’s yet one further twist in this sorry tale. A twist that would appear to make our government look even more irresponsible. A twist that gives the impression Enda Kenny and his absurd collection of incompetents are actively maximising the amount being paid by the Irish people, even as they claim to be minimising it. Less than three months ago, we handed over €715m to Anglo-Irish Bank investors (you have to understand, the €1.25bn in private debt that we’re paying today is just the latest in a long line of payments that will continue for the next seven years at least and will leave this country crippled with sovereign debt). As we made that payment, Shane Ross (independent TD) made the point that the current bondholders were not the original investors in Anglo-Irish Bank. That in fact the current bondholders bought those bonds on the secondary market during a period in 2011 when the market in Anglo-Irish Bank bonds fell by 40%. They ended up paying a little less than 60% of the face value, and today will reap the rewards when Enda Kenny honours the full amount. As Ross said, quite correctly, the current bondholders “decided the Government was going to sting the taxpayer, rather than sting them, and so they bought”. Which raises the obvious question… if Kenny, as he claims, was always determined to cover the full amount of these bonds, why in the name of everything that’s sacred did he not instruct the treasury to buy the bonds when the price dropped by 40%? I mean, I don’t think the Irish people should be paying even 1% of the private debt run up by greedy fools, but if our Inglorious Leader is determined to pay those debts, why insist on paying 100% when there was an opportunity to pay 60%. Is it me, or is that just wilful idiocy? 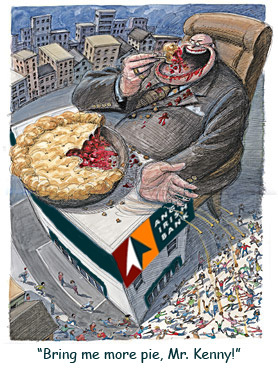 The original ‘more pie’ cartoon was taken from ANU News and slightly altered.